A breakthrough made by Australian researchers working with the Deep Exploration Technologies Cooperative Research Centre (DET CRC) will assist the discovery of new mineral deposits. Mapping of an ‘alteration halo’ around the Emmie Bluff mineral system has increased the size of the exploration target by 100 times. Researcher Mr Simon van der Wielen and colleagues at the University of Adelaide and DMITRE (South Australian Department of Manufacturing, Innovation, Trade, Resources and Energy) have used a number of leading edge techniques to understand and map a distinctive ‘alteration halo’ surrounding an IOCG (iron oxide copper gold, i.e. Olympic Dam) style mineral deposit in the highly prospective Gawler Craton of South Australia. “Searching for a mineral deposit is like looking for a needle in a haystack,” Mr van der Wielen said “They are particularly hard to find when covered by barren rocks in the vast Australian outback”. Research conducted on existing drill holes in the vicinity of the Emmie Bluff mineral system, approximately 100 km south of Olympic Dam, has confirmed that the rocks for up to 10 kilometres around the mineralisation bear a distinctive signature, or ‘halo’, increasing the size of the drilling target by 100 times. “The ‘halo’ comprises distinctive minerals that show where hydrothermal fluids have passed through the crust,” Mr van der Wielen said. Dr Paul Heithersay, Deputy Chief Executive at DMITRE said the collaborative research had re-sampled and re-analysed boreholes in South Australia’s drill core reference library and also data in digital records. 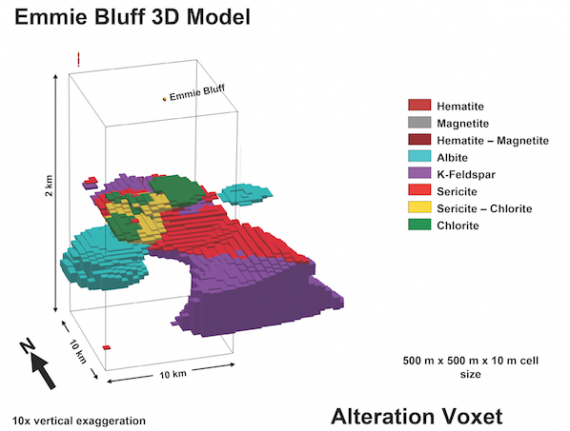 These historical data were combined with sophisticated processing of magnetic and gravity data and with Hylogger spectral scanning and new geochemical results to produce a 3D mineral map of the ‘halo’ around the Emmie Bluff mineral system. “The next steps are to look at other examples in the Gawler Craton and to undertake more detailed geochemical analyses on these samples to produce a mineral map of an alteration halo around an economic mineral deposit. It’s a very exciting result. These ideas and techniques can be readily used by explorers searching for other IOCG deposits in the Gawler Craton,” Dr Heithersay said. Professor Richard Hillis, CEO of the DET CRC, said the project demonstrated the value of industry, university and government collaboration. “Simon is a University of Adelaide researcher funded by DET CRC and embedded with the team at DMITRE. Combining this ‘halo’ work with new cheap, rapid and environmentally friendly drilling also being developed by DET CRC research teams, will revolutionise mineral exploration,” he said. Figure shows the location of the ‘halo’ around the Emmie Bluff mineralised zone and the distinctive minerals that characterise the ‘halo’.